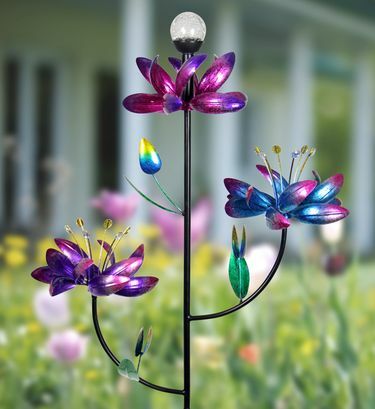 Swirling with color and light, this multi-level triple kinetic flower spinner breathes beauty and life into any garden! Adorned with a solar crackle ball, this piece of art will also automatically illuminate at dusk for hours of color changing fun! Made of durable metal that has been UV treated to help resist fading in the sun. This wind powered kinetic art is a wonderful addition to your home and a great gift for any garden enthusiast! Size: 22.5" x 9" x 67.75" H.